Inspired by fellow ehangar member Blacksheep, I thought I would do a chronology of the aerial campaigns of the Great War. 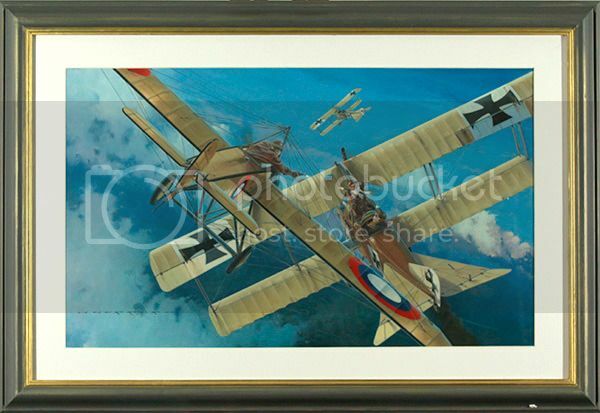 As with Blacksheep's threads on the Battle of Britain and Midway, these paintings will be arranged in chronological order of the historical events they are portraying. I decided straight away to restrict the thread to including artworks that depict events with a specific date- ie August 8th, 1916 etc rather than just portraying a 'general' or 'typical' scene in a phase or month of the conflict. I had initially planned to do the whole of the Great War but very soon I realised the thread would be enormous! Instead I narrowed it down to the first two & a half years of the war, an era of which there are fewer aviation paintings portraying. 'Leaving For France' by Roy Cross. Royal Aircraft Factory BE2As of No 2 Squadron Royal Flying Corps depart Britain to fly across the Channel to France on August 13th, 1914. No 2 Squadron was the first RFC unit to arrive in France in the Great War. Three more RFC squadrons flew across the Channel later that same day. A total of 60 British aircraft made the crossing on August 13th and all of them reached their designated aerodromes intact, a remarkable achievement considering the high attrition rate of aircraft lost crossing the Channel later in the war. 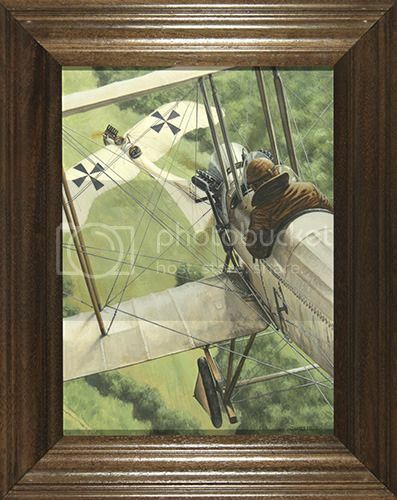 This painting by Roy Cross was shown at the 2014 annual British Guild of Aviation Artists Exhibition. Lieutenant Herbert D Harvey-Kelly of the Royal Flying Corps became the first British pilot to land an aircraft in France after the declaration of war between England & Germany. 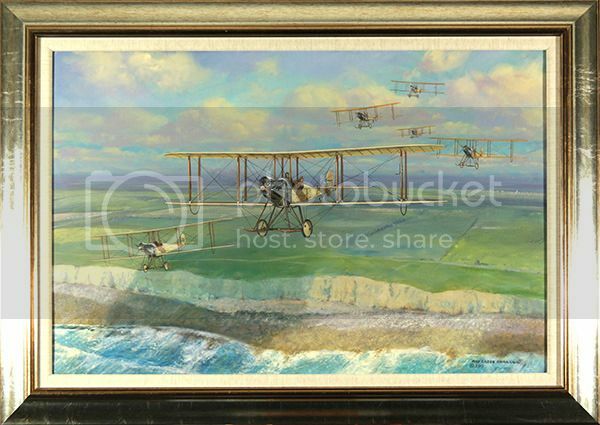 No 2 squadron, to whom Harvey-Kelly belonged, was ordered to cross the Channel to France on August 3rd, 1914. Based in Montrose, Scotland at the time, the unit was obliged to first head south to Dover. The unit was delayed by poor weather and Harvey-Kelly damaged his Royal Aircraft Factory BE2a in a landing accident at Kettering, forcing him to switch to another aircraft. Eventually reaching Dover on August 9th, the Squadron re-grouped and prepared itself for the Channel crossing, awaiting better weather. Shortly before 0630hrs on 13th August, the BE2as of No 2 Squadron took off and headed out over the Channel, the first of over 60 RFC aircraft that would make the crossing that day. Without any mishaps, the scattered aircraft of No 2 squadron crossed the French coast and headed towards their base at Amiens. The Squadron CO, Major Charles Burke, naturally expected to land first but he spotted another BE2 which had flown low over some nearby woods, taking a short-cut. The aircraft was Harvey-Kelly's and he touched down at 0822hrs, becoming the first British pilot to land in France. On August 22nd, 1914, the British Expeditionary Force (BEF) was advancing through Southern Belgium to intercept the approaching German army. The British Commander Sir John French was unaware that the French forces on its immediate right flank had retreated, leaving the BEF dangerously exposed to the German First Army which was rapidly approaching from the north. On that day, a number of aeroplanes of the fledgling RFC were airborne, flying reconnaissance patrols to detect the enemy's movements. 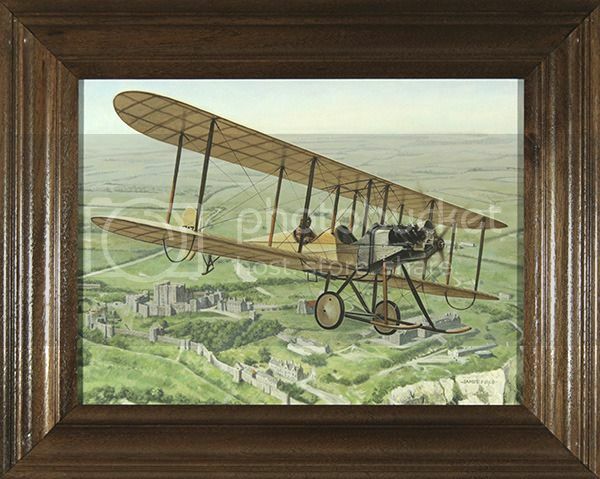 The RFC was operating BE2s, Farmans, Avro 504s and French-built Bleriots. 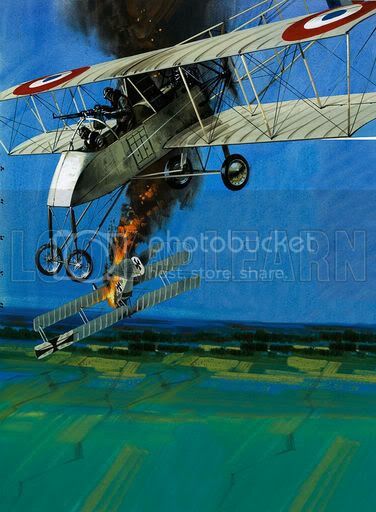 On that day, the RFC suffered its first combat loss when an Avro 504 piloted by 2nd-Lt Vincent Waterfall was shot down by ground fire from the German 5th Division. Both Waterfall & his observer were killed. However, another aircraft piloted by Captain L Charlton, spotted the advancing columns of General Von Kluck's First Army moving southwards towards the exposed flank of the BEF. Charlton landed at BEF headquarters to deliver a timely warning to French who withdrew the British forces back to a more defensible position in and around the small town of Mons where the British army's first battle of the Great War would be fought on the following day. On August 25th, 1914, Lieutenant Herbert Harvey-Kelly, flying with two other BE2s of No 2 Squadron, encountered a German Etrich Taube ('Dove'), an un-armed reconnaissance plane like the British aircraft. Operating as a team, the BE2 pilots boxed the Taube into a progressively smaller area, making feint attacks and fooling the Germans into thinking that the English fliers carried fire-arms. Harvey-Kelly eventually forced the Taube pilot to land. 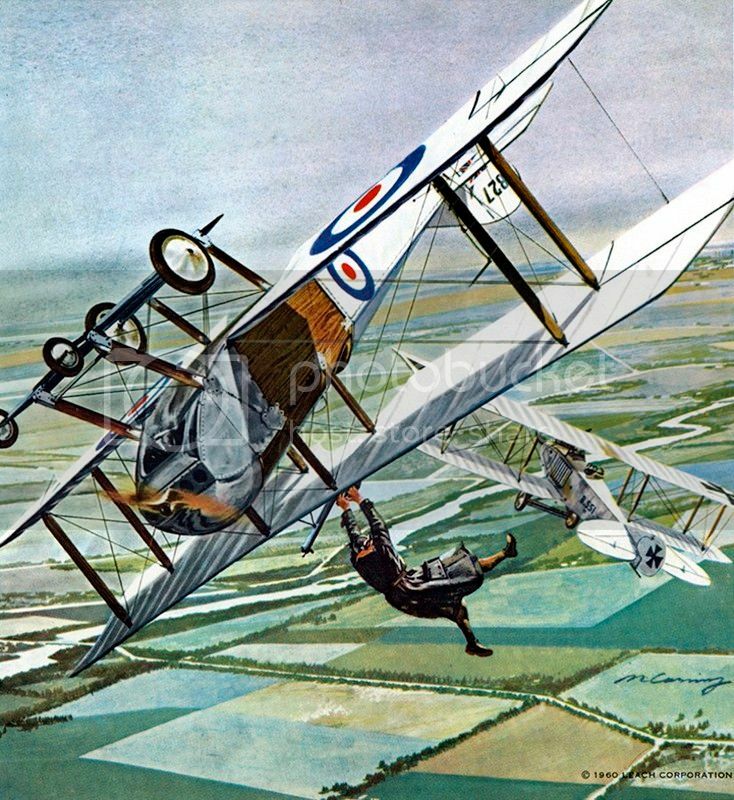 The British pilot landed his own aircraft nearby and Harvey-Kelly's observer attempted to chase the German pilot into nearby woods without success. After setting fire to the Taube, the BE2 crew took off again, having achieved the RFC's first aerial victory of the Great War. Harvey-Kelly continued to serve in the RFC, receiving a DSO in February 1915 and a promotion to Captain in January 1916. On April 29th, 1917, whilst flying a SPAD VII fighter, Harvey-Kelly was shot down by a German Albatros fighter flown by ace Leutnant Kurt Wolff. Badly injured in the subsequent crash which took place behind enemy lines, Harvey-Kelly died three days later in a German hospital. An Etrich Taube monoplane of the Imperial German air-force performs a bombing raid on Paris on 30th August, 1914. 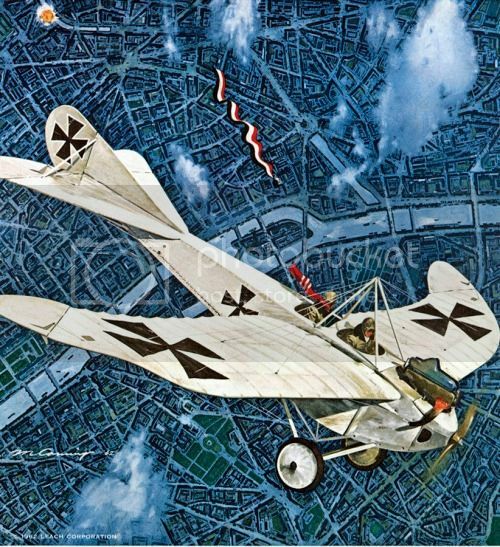 As German armies to the north and north-east of the French capital advance southwards and the Anglo-French armies withdraw towards the Marne, the Taube monoplane of Leutnant Ferdinand von Hiddessen arrived over Paris at 12.45pm and the pilot dropped four small bombs by hand from the cockpit. They exploded in the city below, killing between one and three civilians (accounts vary) and injuring several others. Hiddessen then made another pass over the city centre, dropping a weighted bag containing propaganda leaflets. Attached to the bag was a six foot long thin banner in the tri-colours of the Imperial German flag. The bag landed intact in a street and was taken to a police station where it was opened, revealing a bundle of leaflets which warned the citizenry of Paris that the German army was at the city's gates and urged the populance to surrender. Apparently, Hiddessen had made an error, dropping the bag itself rather than opening the bag and pouring out the leaflets so they scattered widely over the city as planned. The raid is popularly believed to have been the first ever air-raid on a city but the actual first attack took place weeks earlier on August 6th when the German Zeppelin Z.6 bombed the city of Liege in Belgium, killing nine civilians. Nonetheless the French capital received a daily visit from at least one Taube almost every day for the next several weeks. Often the aircraft arrived at a similar time of day, prompting Parisians to dub the daily attacks as 'the five o'clock Taube'. Hiddessen was shot down over Verdun in 1915 and was captured by French troops, spending the rest of the war in a POW camp. After the war, he became a farmer in Germany and in the 1920s, he joined the fledgling NAZI party, rising in the ranks to become a senior figure in the internal administration of the party by the mid-1930s. He served in the Luftwaffe during WW2 and was imprisoned by the Allies for several years after the end of the war. He worked as a farmer for the rest of his life up until his death in 1971. Another depiction of the same event as above. Like many of Hardy's works, this painting was featured in the 1970s educational magazine 'Look & Learn'. 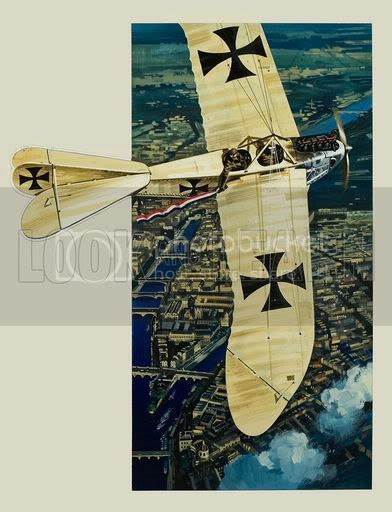 On September 7th, 1914 (or August 25th by the old Russian calendar which was still in use at that time), Russian pilot Pyotr Nesterov was flying a French-built Morane-Saulnier Type G monoplane-fighter when, near the town of Zhovkva in the Ukraine, he sighted a German Albatros B-II, an un-armed two-seater reconnaissance machine. Nesterov was already a famous airman in his native country. Born in Novgorod in 1887, the son of a career army officer, he had been sent to military school and then to the Mikhailov artillery academy in St Petersburg. He served as a 2nd-Lieutenant in a Siberian artillery unit for several years before being sent to work in an aviation manufacturing firm in 1909. A boyhood joy flight in a hot air balloon had fired an interest in aviation and Nesterov made the most of this new opportunity, learning to fly and graduating as a pilot in 1912. On September 9th, 1913, Nesterov achieved a landmark in aviation history when he became the world's first aviator to perform an aerial loop which he achieved in a Nieuport IV monoplane over Kiev. The un-authorised stunt saw him briefly arrested but when famous French aviator Adolphe Pegoud performed the same manoeuvre a few days later, the charges were dropped. Nesterov served as a pilot in the Imperial Russian air-force and when war erupted in August 1914, he was soon flying reconnaissance and bombing missions over the Eastern Front. Sighting the enemy Albatros, Nesterov dove to attack, drawing his revolver and firing a number of rounds without any effect. Determined to bring the enemy machine down, Nesterov aimed his Morane directly at the German plane and dived towards it. It was likely that he intended to inflict a glancing blow in order to disable the Albatros but evidently Nesterov misjudged his approach and instead directly rammed the enemy aircraft. Both aircraft tumbled earthwards to destruction. The Albatros crew, pilot Friedrich von Rosenthal and his observer Franz Malina, were both killed outright whilst Nesterov was greviously injured and died in hospital the following day. During the Second World War, a number of Russian pilots emulated Nesterov's ramming tactic, using it to destroy German aircraft and then, if possible, escaping with their lives by parachute. Nesterov's name still endures today in international aviation. Winners of the annual World Aerobatics Championships are awarded the Nesterov Cup. 'China's German Air-Force' by Mervyn Corning. In 1914, the German colony at Tsing-Tao, China came under threat by military forces of Japan which had sided with the Allies. 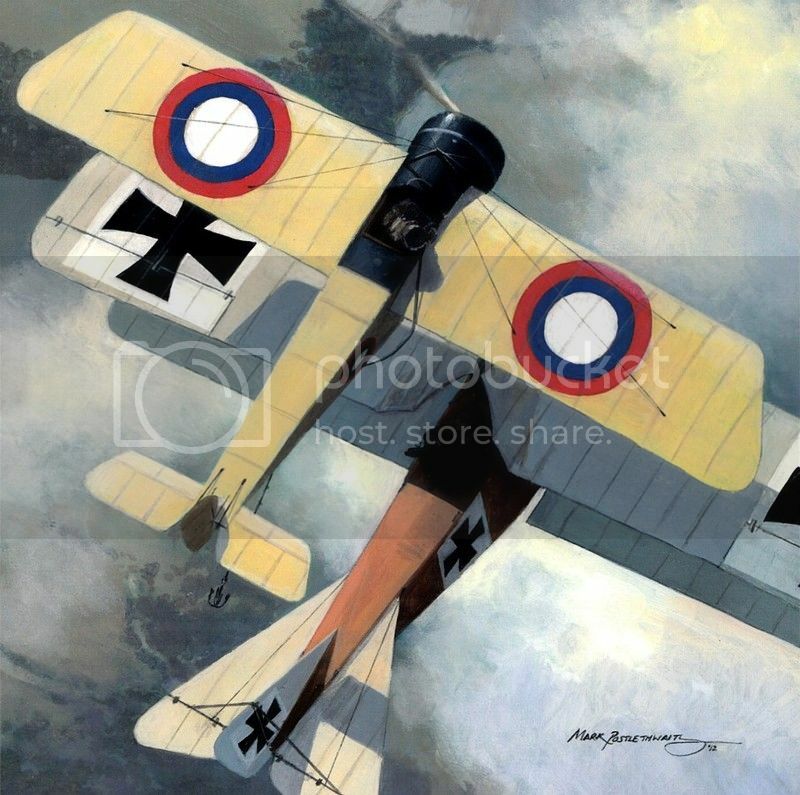 The small German detachment defending the colony included a single aeroplane, a Rumpler Taube flown by Oberleutenant zur Gee Gunther Pluschow. 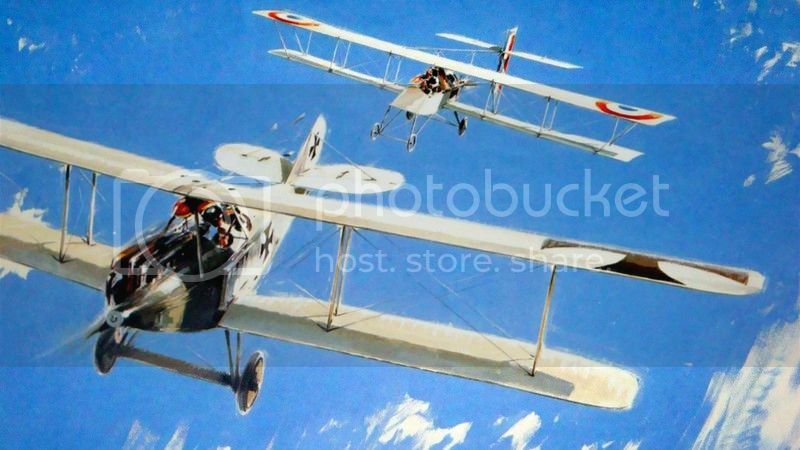 On September 26th, 1914, Pluschow encountered a French-built Maurice-Farman of Japan's air-force in what was the only air-to-air action fought over China during the Great War. Pluschow, armed only with a Luger pistol, maneuvred his aircraft underneath the Farman and fired a number of shots. Several rounds hit the Farman, forcing it to land. Two months later, Tsing-Tao was captured by Japanese troops and Pluschow escaped back to Germany. 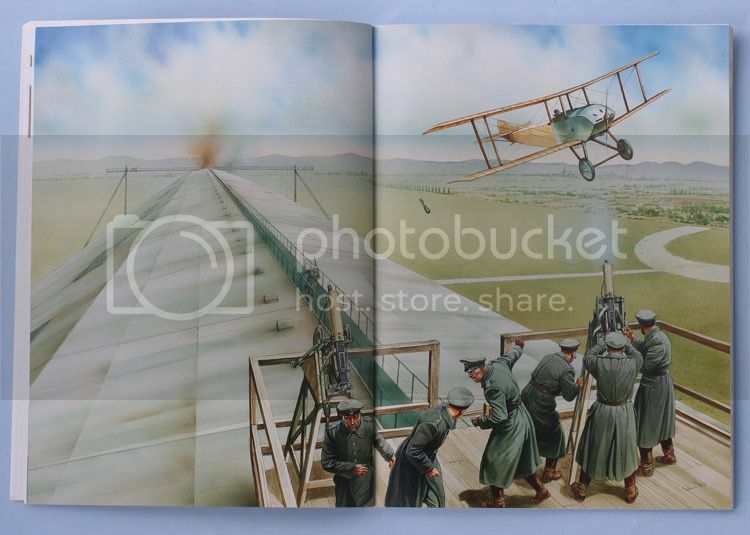 Another depiction of the aerial action over China on Sept 26th 1914. Gunther Pluschow had an extraordinary series of adventures after this event. Attempting to fly out of China, he crashed into a rice paddy and made his way on foot to Nanking where he managed to narrowly avoid arrest and escape by train to Shanghai. 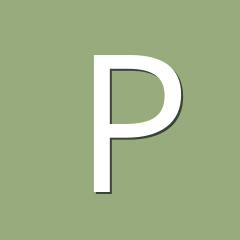 The daughter of a German diplomat gave him false papers that enabled Pluschow to pose as a Swiss national and make his way by ship to the United States. Hiding in New York (as British officials were on the look-out for him), he managed to secure a place on a ship bound for neutral Spain but bad weather diverted the ship to Gibraltar where he was arrested by British authorities. Sent to a POW camp in Britain, Pluschow absconded one stormy night in July 1915 and using a false identity, got a job as a dockyards worker in London, before wrangling a space on a ship heading to neutral Holland. Upon reaching the Netherlands, he made his way to the German border and finally reached home, only to be briefly arrested as an Allied spy as no-one initially believed the incredible story of his journey and escape. Once his credentials were proven, Pluschow was feted as a hero and he became a famous figure in Germany. He served in the German Naval air force for the remainder of the Great War. After the war, Pluschow worked in commercial shipping and spent a great deal of time in South America, a continent he grew to love. He earned enough money from his best-selling memoirs to bring a Heinkel seaplane to Argentina where he established the first air-mail service in 1928, a feat for which he remains a famous figure in that country. Over the following three years, Pluschow explored by air some of the most remote and in-accessible regions of South America. In 1931, Pluschow and his co-pilot were killed in a fatal air crash whilst exploring the Perito Moreno Glacier in Argentina. 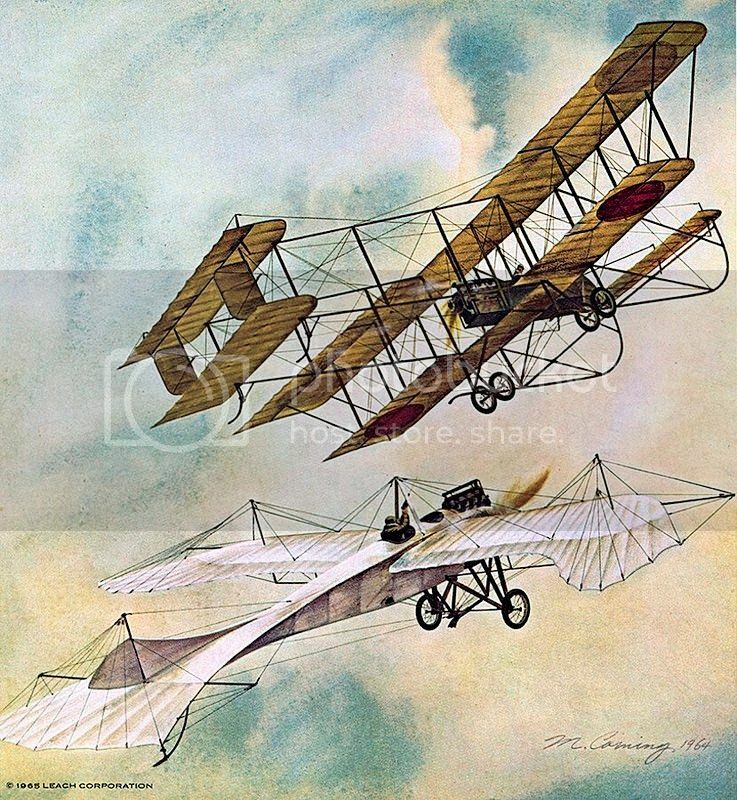 In what is generally accepted as the first instance in which an aircraft shot down an opponent in aerial combat occurred on October 5th, 1914. Flying a Voisin-III of the French air-force, Sgt-Pilot Joseph Frantz and his observer/gunner, Air-Mechanic Louis Quenault, encountered a German two-seater Aviatik over the French village of Jonchery-sur-Vesle. 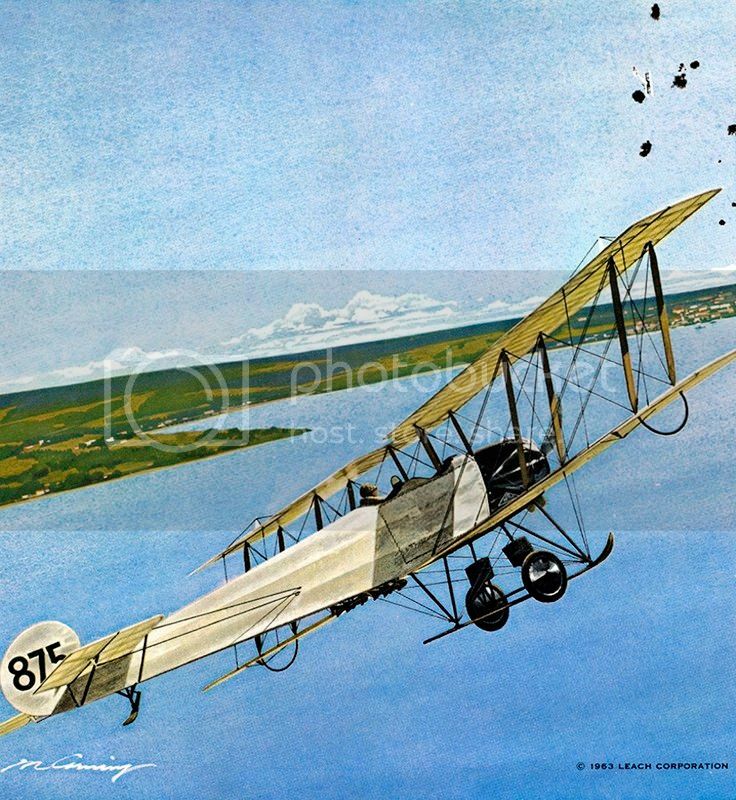 The Aviatik's observer was seen to take out a rifle and he began firing shots at the Voisin. Frantz's aircraft was better-armed, carrying a 8-mm Hotchkiss machine-gun mounted in the front cockpit. Quenault fired off two drums of ammunition at the enemy plane. The Hotchkiss then jammed and Quenault brought out a rifle and fired several more rounds but the Aviatik was already mortally damaged. The latter crashed behind French lines. 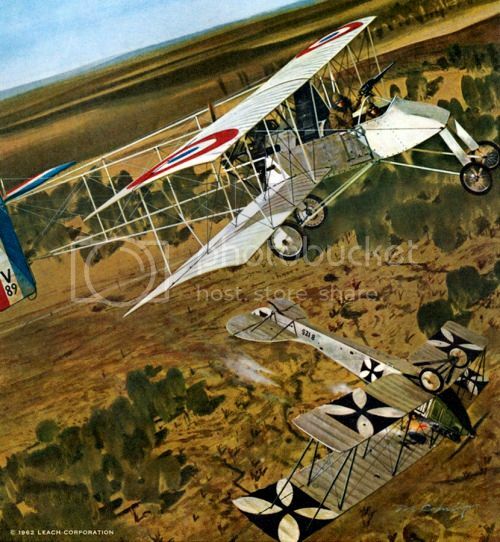 The pilot, William Schlingting, was already dead, killed by one of the Hotchkiss rounds whilst the observer, Fritz von Zangen, perished in the crash. Frantz later visited the crash-site and found the wreckage being looted by souvenir hunters. He later sadly commented that he got no satisfaction nor any feeling of triumph from the death of his enemies. Another depiction of the same incident as described above. The French pilot, Joseph Frantz, survived the war and lived until 1989. 'First Victory' by Paul Lengelle. 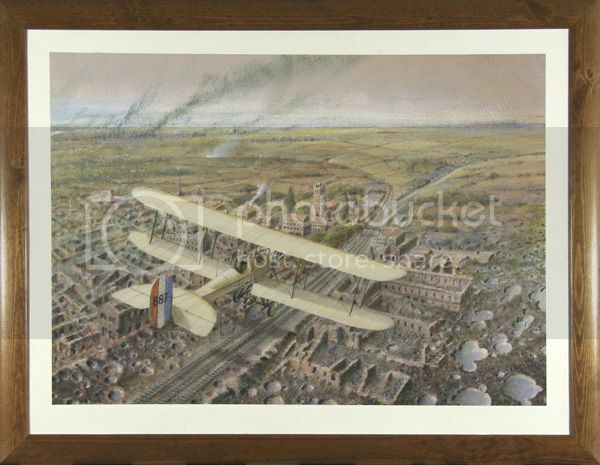 A watercolour depicting the same incident as above on October 5th, 1914. Contrary to popular belief, the incident was not the first ever dogfight, nor the first time an aircraft brought down another. US historian Harry Woodman asserts that the first hostile encounter between two aircraft occurred in 1913 during the Mexican revolution where two American mercenary pilots, Phil Rader and Dean Lamb, each flying for opposing sides, had an inclusive duel where they fired pistols at each other. And other pilots had brought down enemy aircraft by other means prior to this date, including Englishman Harvey-Kelly who forced down an enemy plane through sheer intimidation and Russian aviator Nesterov who destroyed an opponent through ramming (at the cost of his own life). However, Sgt Jospeh Frantz was the first to destroy an enemy plane outright with gunfire. On October 8th, 1914, a pair of Sopwith Tabloids carried out what was the first strategic bombing mission against Germany. The two British pilots, Squadron-Leader D A S Grey and Flight-Lieutenant Reggie L G Marix, were charged with bombing the huge German Zeppelin storage sheds at Cologne and Dusseldorf. Thick, murky cloud forced Grey to switch targets and attack the Cologne railway station. Marix, however, had better luck and found the Zeppelin shed at Dusseldorf where the airship LZ.25 was stored inside. Marix dropped his bombs from a height of 600ft and the Zeppelin inside the shed ignited and then exploded spectacularly, the fireball almost consuming Marix's aircraft. Both Tabloids managed to make it back to base and both Grey and Marix were awarded DSOs for their efforts. 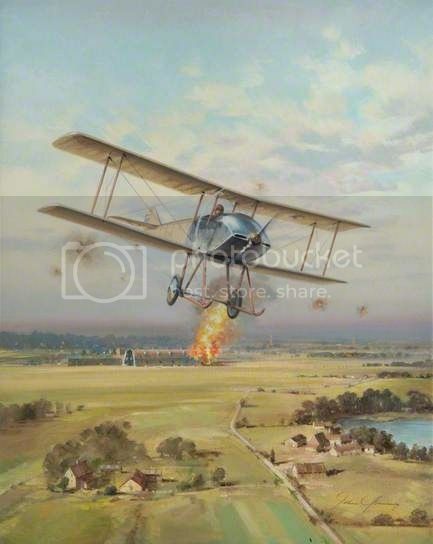 Another portrayal of the bombing raid by Flight-Lieutenant Marix. In 1916, Marix was air-testing a new aircraft near Paris when it suffered a catastrophic structural failure and broke-apart in mid-air. Marix survived the crash but was severely injured, having to have one of his legs amputated. He never flew again but he remained in the RAF as a staff officer after the Great War, eventually rising through the ranks to become an Air Vice-Marshall in WW2. Marix retired in 1945 and he died in 1966. 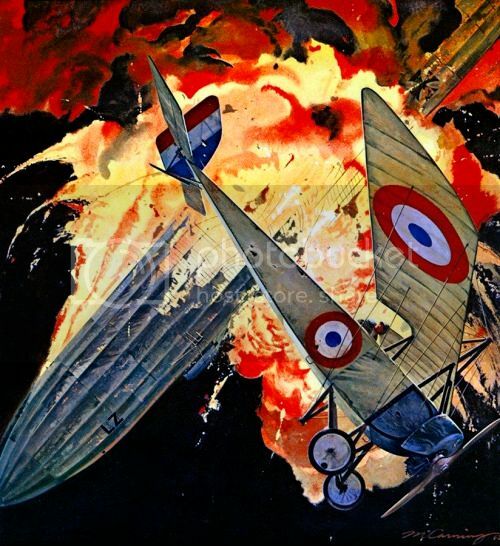 An illustration of the same event for the Osprey book 'The Zeppelin Base Raids 1914'. After the raid on Dusseldorf, the Royal Naval Air Service (RNAS) planned a follow-up raid on German Zeppelin sheds, an operation much more complex and bold. On the evening of November 13th, 1914, operating under great secrecy, a train arrived at Belfort in south-east France, an airship field located 50 miles from the German border (and only 12 miles from the Swiss border). On board the train were four Avro 504 aircraft, dis-assembled and packed into crates, along with British RNAS air-crew under the command of Squadron-Leader Shepherd. Permission to use the location as a launching base for the attack had been gained only after lengthy and delicate negotiations with the French with the condition that the raid be carried out before December. The small force planned to launch a surprise bombing raid on the German Zeppelin sheds at Friedrichshafen, located some 125 miles to the east. Time was of the essence as it could only be a matter of time before the base was discovered. The RNAS personnel assembled the Avro aircraft and fitted the special bomb-racks, designed to carry and drop the 20-pound Hale bombs, four of which would be carried by each aircraft. Although the 504 was a two-seater, the pilot would fly each plane alone, the other cockpit rigged to serve as a spare fuel tank. During the preparations in cold weather, Shepherd fell ill and damaged one of the aircraft during taxying trails. He was replaced by Squadron-Leader Roland Cannon. On the morning of November 21, the four aircraft were wheeled out and take-off commenced at 9.30am. One of the Avros (Cannon's), the one that had been damaged, proved unable to lift off despite the makeshift repairs so only three aircraft began the mission, piloted by Squadron-Commander Edward F Briggs and Lieutenants John Babington and Sydney Sippe. Unable to fly in formation due to the Avro's high cruising speed, the three pilots flew individually to the target. Briggs was the first to reach the Zeppelin base at Friedrichshafen at 11.30am but his plane was hit by anti-aircraft fire after he dropped his bombs. His aircraft force-landed at the base and Briggs, badly injured, was captured. Sippe arrived next, dropping three of his bombs whilst the fourth failed to detach. Flying low over Lake Constance, he evaded the AA fire and made it back to base. Last to attack was Babington who dropped his bombs at the target despite his plane having engine trouble. Forbidden by the French to carry maps, Babington got lost en route home but by good luck, he landed his fuel-starved plane in French territory. Briggs, Babington and Sippe were all awarded DSOs and the British Press made the most of the raid's propaganda value, proclaiming it a great success. In reality, actual damage inflicted to the Zeppelin base was slight, limited to minor damage to one of the workshops and to the main doors of one of the airship sheds, along with damage to a nearby house. Casualties on the ground were one killed and two injured. After the raid, the Germans strengthened AA defences around their Zeppelin sheds and where possible, moved them deeper into German territory, out of range of Allied air attack. Another portrayal of the raid on Friedrichshafen. Squadron-Commander Edward Briggs, after his release from a German hospital, was transferred to a POW camp from which he later escaped. He survived the war and remained in the RAF, eventually becoming a Group Captain during WW2. His son Michael, a fighter pilot in the RAF, was killed in 1941. Briggs himself died in 1962. Lieutenant John Babington also survived the Great War and remained in the RAF until 1944, retiring with the rank of Air Marshal. He died in 1979. Lieutenant Sydney Sippe likewise survived the war but left the RAF, later working as a sales manager for two aviation companies and also as an inventor and an engineer. He died in 1968. 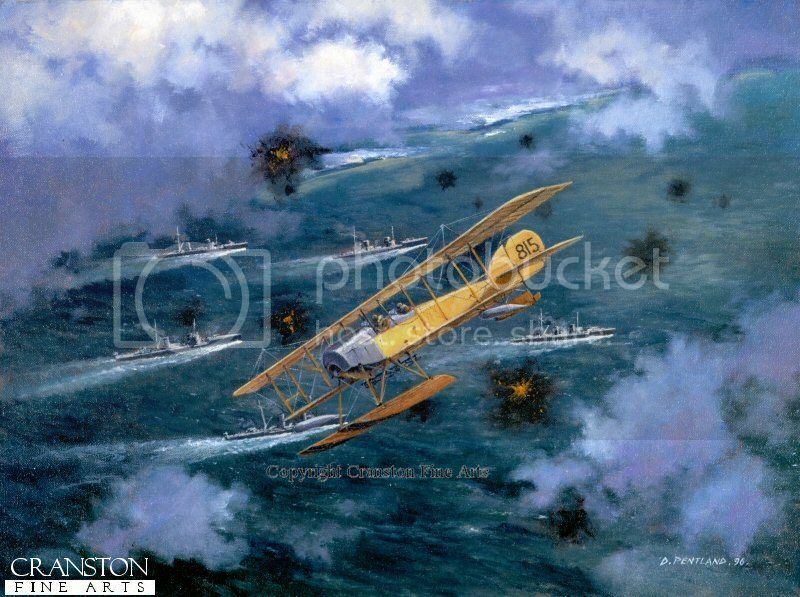 On December 25th, 1914, the Royal Navy carried out the first ever co-ordinated sea and air attack on an enemy target. Three RN seaplane tenders with several warships as escorts, sailed into the North Sea and set up a temporary base at the small island of Helgoland. On Christmas Day, the tenders launched a total of nine Short seaplanes of various models in near-zero temperatures. The engines of two of the planes refused to start in the freezing conditions and both aircraft had to be winched back on board but the remaining seven aircraft managed to get airborne. Their objective was the Zeppelin sheds at the Nordholz air-base near Cuxhaven. Poor visibility and heavy anti-aircraft fire hampered the bombing attack on the air-base and the damage inflicted was limited. However the British were pleased with the results of the raid as it proved the feasibility of such operations and none of the aircrew's lives were lost. Of the seven aircraft who participated in the raid, three were recovered intact by the tenders, three more landed near the Island of Nordeney and their crews were rescued by a British submarine (the aircraft were deliberately scuttled) and the last aircraft was reported missing but the crew was rescued by a Dutch trawler. One of the aircrew who took part as an observer was Lieutenant Erskine Childers, famous for being the writer of the espionage novel The Riddle of the Sands which had been a bestseller before the war. A staunch Irish nationalist, Childers became radicalised after the war and was a leading figure in the Anglo-Irish troubles prior to his death by execution in 1922. Great thread Pete. Some excellent artwork, and the narratives are really informative. Well done! 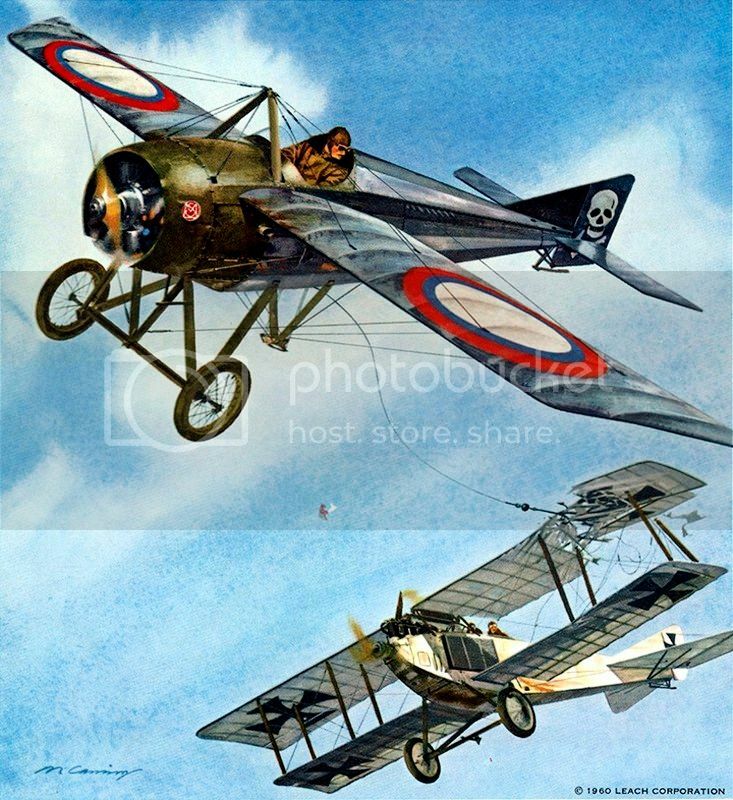 On March 31st, 1915, over the Eastern Front, a Morane-Saulnier Type G of the Imperial Russian air-force approached a German Albatros two-seater. The German crew were puzzled to see the Russian fighter trailing a long cable at the end of which was a five-pronged anchor and an iron ball. The strange weapon was the 'Katze' and the pilot was Alexander Kazakov, destined to become Russia's most successful Ace of the Great War. Kazakov flew his French-designed fighter in a low pass over the Albatros, the dangling Katze tearing a gash through the left upper wing, tearing it to shreds and sending the German plane tumbling earthwards. Kazakov had achieved his first aerial victory. By 1918, he was credited with 20 confirmed victories although the total was likely higher as Russian pilots were only credited with enemy aircraft which crashed within Russian territory. Unwilling to support the new Bolshevik government, Kazakov resigned from the air-force in early 1918 and he later fought against the Reds during the Russian Civil War the following year. After the British withdrew their military support for the pro-Monarchy forces, Kazakov became severely disillusioned over the future of his country. 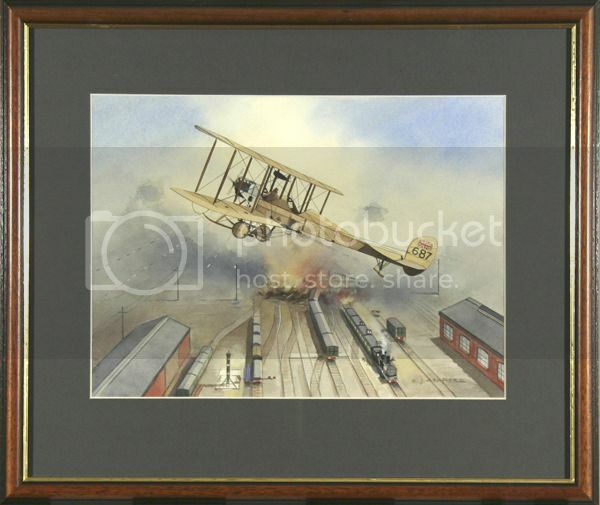 He died in what was officially deemed to be an accidental crash at an air-display in August 1919 but many witnesses were convinced it was an act of suicide. A painting depicting the same incident as above, with more accurate markings on both aircraft. 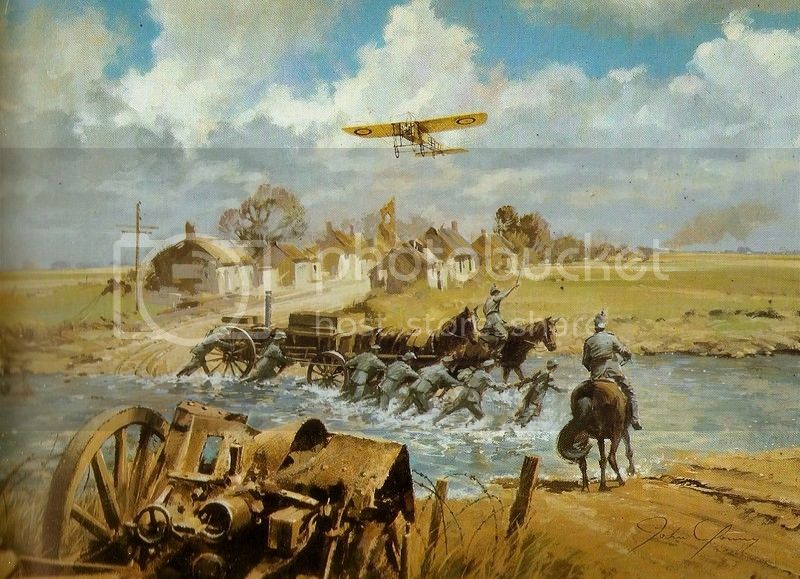 This painting featured on the cover of the Osprey Aircraft of the Aces Book 'Russian Aces of the First World War'. On April 22nd, 1915, German ground forces unleashed a poisonous gas attack on positions held by the French 45th Division near Ypres. An infantry assault soon followed, beginning what would be known as The Second Battle of Ypres. Frantic Allied counter-attacks checked the German advance through the broken Allied forward lines but aerial reconnaissance warned of German reserve forces moving by rail towards the battle area. The RFC was called upon to disrupt enemy lines of communication and to delay transportation of reinforcements to the Front. 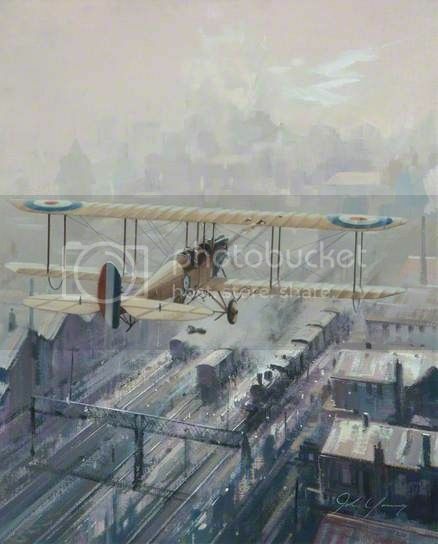 No 2 Squadron was detailed to bomb German railway stations and 2nd-Lieutenant William Rhodes-Moorehouse was allocated the target of the railway station in the Belgium town of Courtrai. Just after 1500hrs on April 26th, he took off in a BE2b loaded with a 45kg bomb from his unit's aerodrome at Merville. Rhodes-Moorehouse, whose parents had been born in New Zealand (his mother was part-Maori), had been with the squadron for only five weeks. Arriving over Courtrai, Rhodes-Mooreshouse flew towards the target at a height of only 300 feet. He released his bomb at the railway station but his aircraft came under intense small-arms fire from the large number of German troops in the town. A machine gun post located in the belfry of Courtrai's church also opened fire at his aircraft. 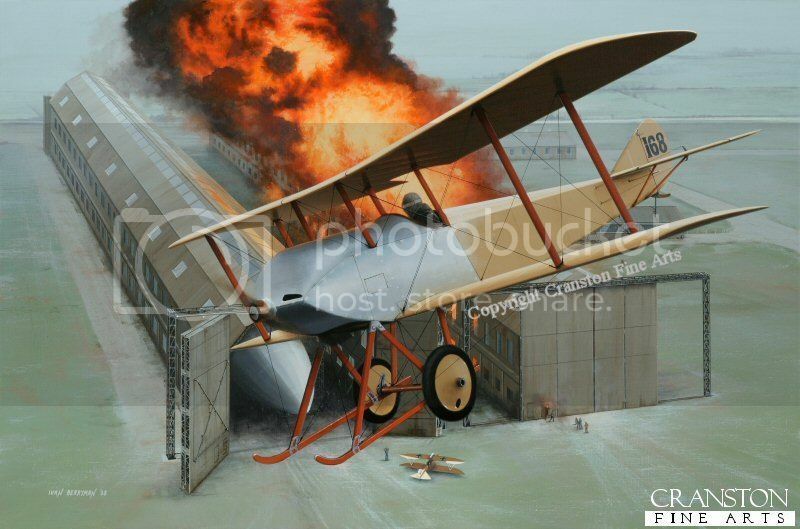 The BE2b was badly hit and Rhodes-Moorehouse was shot in the chest and abdomen. Managing to stay conscious, he was determined to make it back to Allied lines and managed to coax his damaged plane some 35 miles back to the base at Merville. Flying at low level to gain more speed, he was fired at several more times by German troops and was wounded twice more. At 1615hrs, he landed his battered plane at his aerodrome where ground-crew lifted him from his cockpit. Still conscious, he insisted on making a full report to his CO before being carried off for medical treatment. At the casualty-clearing station, it was soon apparent that his wounds were beyond treatment and the dying 27-year-old officer was made as comfortable as possible. He is said to have remarked 'If I must die, at least give me a drink!'. Whilst still conscious, he requested that his body be shipped home for burial. Rhodes-Mooreshouse lingered until the afternoon of the following day (April 27th) and died with a small photograph of his infant son William Jnr in his hand. Rhodes-Moorehouse was posthumously awarded a Victoria Cross, the first airman to receive one in the Great War. His body was taken back to Britain and buried in Beaminster. His young son William Jnr grew up to become a pilot like his father and flew Hawker Hurricanes in the Battle of Britain until he was killed in action in September 1940. Another painting depicting the same event as above. Another version of Rhodes-Moorehouse's final mission. 'The Strange Story' by Mervyn Corning. 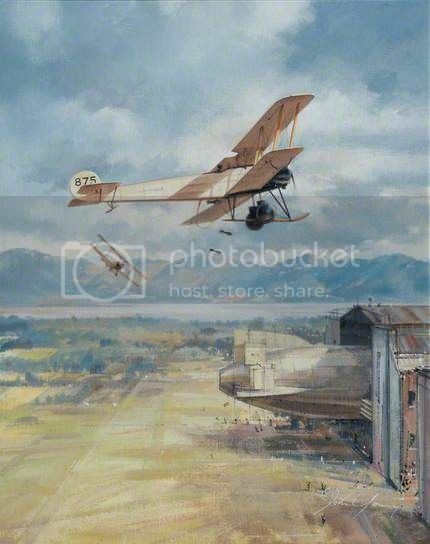 On May 10th, 1915, Lieutenant Louis A Strange, a pilot serving with No 6 Squadron of the Royal Flying Corps, took off on a patrol in his Martinsyde S.1 Scout. He encountered a German two-seater Aviatik and dove to attack it. His S.1 biplane had a Lewis-machine gun mounted on the upper wing, with an ammunition drum that held 47 rounds and had to be changed by hand. This procedure involved the pilot un-doing his safety straps and standing up in the cockpit to change the drum on the weapon above his seat. Strange quickly emptied his first drum at the German plane, seeing no apparent results. 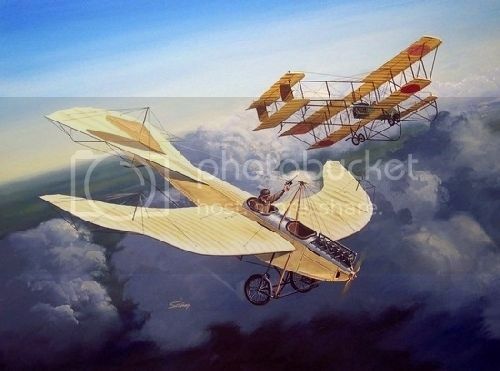 Un-buckling his safety straps, he raised himself upright in the cockpit to attach a fresh drum to his Lewis MG. At that moment, the Martinsyde abruptly flipped over, leaving Strange dangling in mid-air from his upside-down aeroplane, hanging on to the ammunition drum of the Lewis. The aircraft began to spin earthwards. Strange desperately tried to hoist his legs back into the cockpit, his boots shattering the instrument panel. He swung his legs backwards, his boots catching on the rim of the cockpit. By arcing his back, Strange managed to get himself into the cockpit. He grabbed the control column and shoved it hard to one side which was the standard method of getting an aircraft out of a spin. The Martinsyde righted itself and levelled out with only 500 feet to spare but the sudden force proved too much for the seat which broke, sending Strange sprawling onto the floor of the cockpit, his feet sticking upwards, his head facing rearwards along the narrow fuselage. Somehow he managed to wriggle himself around and grip the control column. Unable to see over the rim of the cockpit and without any working instruments, Strange somehow managed to fly his aircraft back to base. His CO reprimanded him for carelessly damaging his own plane and none of his fellow pilots believed his story. After the war, Strange read an article in a newspaper containing an eyewitness account of two German air-crew who had seen a British flier hanging upside down from his plane. Strange tracked the two men down who turned out to be the Aviatik crew who had both survived the war. The Germans were relieved to discover that Strange had escaped with his life as they had felt so sorry for him, seeing him hanging helplessly from his aircraft. Louis Strange served as a commander of training units and bomber squadrons during the Great War, earning an DFC and DSO. He served with the RAF in WW2, flying a Hawker Hurricane from France to Britain in June 1940, evading an attack by Me-109s in the process. He later helped develop the catapult-launched 'Hurricats' which proved vital in convoy defence in the Atlantic. He remained a regular flier until his death in 1966. 'Warneford & Goliath' by Mervyn Corning. On 7th June 1915, Lieutenant Reginald A J Warneford piloting a French-built Morane Saulnier Type L 'Parasol' monoplane of No 1 Air-Wing of the RFC, intercepted the German Zeppelin LZ.37 over the Belgian coast at Ostend. He chased the massive airship and managed to climb above it, dropping several small bombs. One of these struck the Zeppelin, igniting a massive explosion, the force from which buffeted Warneford's aircraft, flipping it upside down and stalling its engine. As the burning wreckage of LZ.37 crashed in nearby Sint-Amandsberg, Warneford glided his aircraft to a force landing behind enemy lines. He frantically worked on his engine for half an hour and managed to re-start his plane and take off again before any German troops found him. Warneford was awarded the Victoria Cross for his exploits that day.